Worldwide, book cafes have become centers for conversation, friendship, literature and coffee, and are now indispensable parts of Istanbul's social scene. While some customers simply use them as places to hang out with friends, others appreciate the sincere, peaceful and homey atmospheres they offer. Regulars will often spend the whole day in their favorite cafe relaxing with a good book and excellent coffee. Styles of the cafes vary. Some cafe owners have decided to honor Turkey's past with Ottoman-era themed shops; others have added personal touches for a more modern, funky vibe. Because they have become so popular, new ones open in Istanbul almost every day. We recently chatted with a few owners and tested the pulse of the young regulars. Nevmekan is a book cafe in Bağlarbaşı, Istanbul. 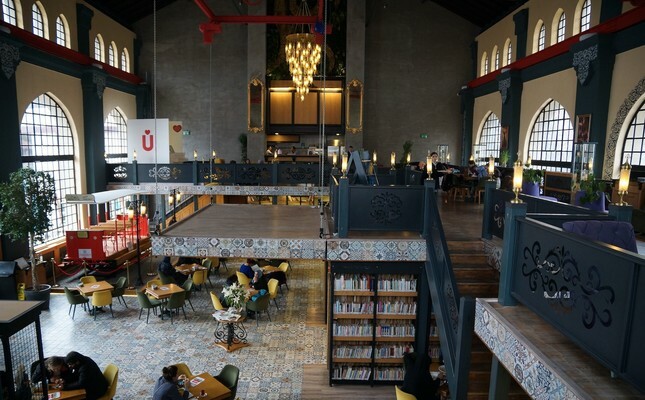 When you step into the old tramway-bus station renovated by Üsküdar Municipality, its huge library consisting of more than 10,000 books stands out right away. The young people scattered inside are either studying or reading books with their coffee and tea right next to them. Some college students were computer scientists, while some are simply interested in books. There are also those who come here to study and do homework. Betül Şengül invited her friends, saying, "Let's go to Nevmekan and study." They are among the computer-related group. "It's quiet here because everyone is studying. We usually hang out here for hours. You can eat, study and drink coffee. It's like a home away from home! That's why it's become a popular place for young people," Şengül said. The cafe is popular with housewives, as well. Ahmet Ünal, an employee in the library, says housewives like to borrow books and form reading groups. "I chose this place because I could study comfortably while drinking coffee," said Cengiz Akyüzlü, who is studying for the university entrance exam. "I read books every day for two hours. Good conversations and friendships are born here, as well. I come in the morning and stay until it closes. We have a good rapport with the employees." The Fida Cafe, opened by lawyer Sibel Yardımcı a year and a half ago in Balat, is also the only book cafe in the neighborhood. Balat's neighborhood culture is also reflected in the book cafe, which gained many regulars quickly. A big sister-sibling relationship has evolved between Yardımcı and her regulars. Yardımcı, who has created a nostalgic place, listens to the problems of her customers and also talks about books. Since she is a lawyer herself, students from law schools across Istanbul dominate the list of regulars. Yardımcı frequently answers the questions of her customers and warmly conveys 20 years of experience to the future lawyers. In the library, there are older printed books, which she describes as "books with experience." Breakfast and meals are also served as well as coffee. Most of the regulars discovered this place through social media. "We introduce one book on our Instagram account every week and invite people to read the book, and to come and discuss it." Aleyna Yalçın, 17, who recently discovered the book cafe in Balat, said she and her friends came to this place because of its warm and homey atmosphere and added that venues like this are a hot trend with young people right now. İsmail Memiş, 32, and Ezgi Köroğlu, 28, said they met here, fell in love and recently married. They asked Yardımcı to be one of the witnesses at their wedding ceremony. "We witnessed both their meeting and marriage," Sibel Yardımcı said, smiling. Köroğlu also said she and her husband love the cafe's peaceful feel, sincerity and beautiful books. İsmail Memiş, who is also from Balat, said thanks to the book cafe, the young people of Balat have begun to read more. "I didn't use to read much. I started reading thanks to the book cafe. Over time, we became like a family, not like customers. People come to this place from all over Turkey," Memiş said. New book cafes open almost every day in Istanbul; one of them is Safir Lounge located right behind Fatih Mosque. Erhan Akçaoğlu and Ediz Kentkuran, who have designed more than 200 book covers and spent their lives nestled in books, opened this place thinking that the youth of the Fatih district needed an escape from the lies, deceit and chaos of the outside world by spending time among books. Kentkuran said that while designing the book cafe, they wanted it to ensure it would be a personal haven for people and added that they prefer books that will take people away. "Genre is not important. It can be a novel or a book about history, economy and anthology. Our goal is to prevent people from thinking about the outside world when reading that book," he said. He noted that they will furnish the library with books donated from the personal libraries of many of their writer friends and that each section will be named after the donor. They have three projects, namely: Reading groups, clubs modeled after the poetical assemblies of the Ottoman Empire and in-house conventions, like the ones once held in the Ottoman Empire. "We would like to invite Sezai Karakoç to the poetry club. Books are sources of information; but information is now on the internet," Kentkuran continued. "It's now the age of wisdom. This is not the age of knowledge, but the age of wisdom. This place will be the center of wisdom." Tasarım Yayın Group opened Tasarım Bookshop & Cafe Kadıköy five years ago. The venue features many books on architecture and design. Well-known architects meet with their young colleagues in the cafe, which hosts 3,000 Turkish and foreign books. "We are the only spot that imports books in the field of architecture and design in Turkey," interior architect Emre Tibet said. "Our book cafe, established by people coming from this business, is a living place. We have conferences, workshops and music recitals. When we see a young friend scribbling while sitting in the cafe, we recruit him/her and give them a place on the corner of our publications." There are reading groups in the venue as well as music performances. "We have regulars from many professions, such as doctors, musicians, philosophers and actors. We aim to spread this tradition because young people don't have alternative places to spend time comfortably," Tibet said. One of the regulars, Ayşegül Freman, paints and reads in the cafe. "All kinds of chats go on around here, and friendships are established. People come to these places to socialize, relax and see other people," Freman said. "My husband and I lived in the U.K. for a long time. The cafes there are closed at a certain hour, and there is no cafe culture. Kadiköy, Istanbul is very attractive and different in that sense." Çay Istanbul Book Cafe in Eyüp Sultan opened three years ago. Retired school principal Baki Öztekin says his children, who love reading books, gave him the idea to open a cafe. "I wanted it to be about books as well as friendship," Öztekin said. "My son, Hikmet Anıl Öztekin, is a writer and has published several books, including 'Elif Gibi Sevmek,' 'Eyvallah' and 'Fesleğen.' He holds chats and autograph sessions once a month. His circle of literary lovers also come to the cafe. It's a place that brings together writers and readers. It's like a cultural center." Some books in the cafe can be bought, while some can be read on-site or borrowed. Young people are quite interested in the two-story venue, which hosts many literary chats. Yusuf Samet Çakır, editor-in-chief of Nüktedan magazine, story writer and poet, is one of the regulars of these chats. He is the author of three books, "Mürekkep Kokan 33 El," "Gönül Hale" and "O İş Öyle Değil." He even wrote "Gönül Hale" in this cafe. "Young people are get used to reading books here. We're a nation that created a giant civilization from a cultural heritage," Çakır said. "We reintroduce science, lore and culture into our daily lives in book cafes. This is a teaching area as well as a place to socialize - just like a school! Chat clubs have formed for talking about books. These cafes are today's modern madrasahs." The writers frequently come, meet with readers and leave the books they wrote free of charge. "We come here for breakfast in the morning and stay here until the evening. This is a meeting spot for us. We are good with books. It's a quiet and peaceful environment," 17-year-old high school student Şükriye Öztürk said. Eda Kıyga,18, one of the employees of Çay Istanbul Book Cafe, said they are now friends with the regulars. "There's an atmosphere of friendship. Our slogan is, 'We will be social, not asocial, no internet'," she added.